New claims that biopharma companies abuse federal incentives to develop drugs for rare diseases have rekindled the debate, but the FDA and other stakeholders still say the Orphan Drug Act program is a success. A recent Kaiser Health News report concluded, "[T]he system intended to help desperate patients is being manipulated by drugmakers to maximize profits and to protect niche markets for medicines already being taken by millions. The companies aren’t breaking the law, but they are using the Orphan Drug Act to their advantage in ways that its architects say they didn’t foresee or intend.’ The study’s findings echo similar allegations levied in recent years, incuding those by former Rep. Henry Waxman (D-Calif.), the law’s chief sponsor 10 LSLR, 6/10/16 . The debate raises the issues of whether drug companies are profiting unreasonably in utilizing the ODA, the extent to which the law is helping drugs reach the small populations that have these diseases, and whether the law needs to be changed. Kevin Noonan, partner and biotechnology attorney with McDonnell Boehnen Hulbert & Berghoff LLP, Chicago, concurred with Hasko in a Jan. 27 e-mail to Bloomberg BNA, suggesting a critical look at the KHN data. a waiver of user fees the FDA charges biopharmas under the Prescription Drug User Fee Act. To qualify for these incentives, the drug must first obtain orphan drug designation and then be approved for the rare disease or condition that is the subject of the designation. 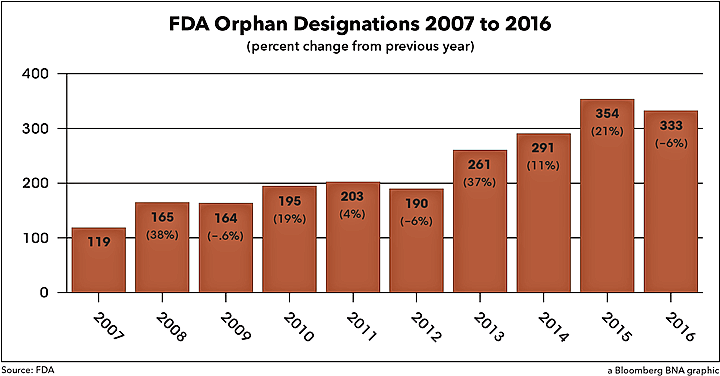 According to FDA data, the agency has granted 3,983 orphan drug designations since 1984. It granted 333 in 2016, nearly double what it granted in 2007 and 75 percent more than in 2012. The KHN report said, “Today, many orphan medicines, originally developed to treat diseases affecting fewer than 200,000 people, come with astronomical price tags,” often at little cost to the biopharmas because some are mass market drugs re-purposed to take advantage of the incentives of the ODA and the subject of multiple ODA submissions. altogether, a third of orphan drug approvals since the program began have either been for re-purposed mass market drugs or drugs that have received multiple approvals. Dr. Gayatri Rao, director of the FDA’s Office of Orphan Products Development, said the agency would investigate these issues and consider a regulatory change, according to the KHN report. The KHN’s criticism wasn’t entirely new. A 2015 commentary published in the American Journal of Clinical Oncology focused on cancer drugs including Novartis’s Gleevec, which treats chronic myeloid leukemia and received nine orphan drug designations. The commentary argued that the drug was never meant to serve an orphan population. A Washington Post article citing the criticisms appeared nine months later, and the KHN report five months after that. Waxman in June 2016 told Bloomberg BNA some companies are applying for multiple orphan drug approvals for the same drug by narrowing a disease into smaller subsets. “There are new cancer drugs that are narrowed down to treat people with a form of cancer or form of cancer treatment that affects relatively few people,” he said, affording drug companies an extra period of exclusivity. The Biotechnology Innovation Organzation (BIO) previously addressed issues raised in the KHN report in response to the August 2016 Washington Post piece, citing a study by BIO, the National Organization for Rare Disorders (NORD ) and Ernst & Young that found there would have been one-third fewer orphan drugs on the market treating patients with rare diseases over the last 30 years without the incentives found in the ODA. BIO declined Bloomberg BNA’s request for comment on the KHN article, noting its previous comments on the issues. The Johnson & Johnson spokeswoman noted to Bloomberg BNA when Remicade was approved for its two orphan drug designations—for pediatric Crohn’s disease in 2006 and pediatric ulcerative colitis in 2011—it became the first treatment option beyond conventional therapy available for an estimated 150,000 children age six to 17 living with these diseases. Roche, which acquired 454 in 2007, closed down 454’s DNA sequencing technologies unit in October 2013, laying off most of the staff. The Kaiser Health News study is at http://src.bna.com/lM6.